The United Architects of the Philippines conferred the UAP Likha Gold Medal Award to Arch. Philip H. Recto during the Honor Dinner of the 45th UAP National Convention. Likha Gold Medal Award is the highest distinction to be bestowed upon a fellow, who has adhered to the highest standards of professional and ethical conduct, practiced in excellence and prestige the architectural profession, has rendered distinguished contribution and service to the UAP, and has performed exceptional achievements and active participation in the concern of the community, government and country. The following is the KEYNOTE SPEECH delivered by Arch. Philip H. Recto upon being conferred Likha Gold Medal Award by the United Architects of the Philippines (UAP) held during the Honor Dinner of the 45th UAP Annual National Convention on April 11, 2019 at the SMX Convention Center, MOA, Pasay City. Distinguished members of the National Board headed by Ar. Benjamin Panganiban, Jr., esteemed members of the College of Fellows led by Ar. Richard Garcia, respected members of the Jury of Fellows chaired by Ar. Ana Mangalino-Ling, fellow Likha awardees, UAP Past National Presidents, our distinguished foreign guests, pillars of the architectural profession, fellow architects and friends in the building industry, good evening. I am truly awed and humbled by the highest accolade that you have bestowed upon me tonight – the Likha Gold Medal Award which is the epitome of professional excellence and ethics. This honor carries with it immense responsibilities which I may not be able to fullfill, but tonight I pledge to do my best to become the role model of an exemplary architect deserving of such an award in order to justify the trust and confidence you have reposed upon me. I shall always remember that tonight is not the time for me to pause and bask in the glory. Rather, the award is a constant reminder for me to strive harder and aim for the highest standard of professionalism, integrity and competence; and bring glory to the architectural profession in general and the UAP in particular. Tonight, I would like to thank my mentors, especially Likha awardee Ar. Froilan Hong who was my college professor at the University of the Philippines - College of Architecture where I graduated in 1970. Had he not given me my first big break by taking me in as an apprentice in his office, perhaps I would not be here tonight; or perhaps I would not even be in the architectural profession at all. Who knows? Tonight, I also pay tribute to my classmate and good friend Ar. David SyCip, Jr., FUAP who passed away early in the year 2000. Together we founded our architectural office and underwent the usual hardships and challenges of a start-up firm. Thank you, Dave, for your friendship. I shall always remember you and your family with deep gratitude. And tonight, I will be greatly remiss if I failed to acknowledge my better half, Ester, who has toiled and persevered with me throughout the saga. She has been my gentle critic, my inspiration and the wind beneath my wings. She had never once discouraged me from my Don Quixote pursuits but has always encouraged me to attain greater goals. Thank you, Ester, I love you. I would also like to thank my past and present collaborators some of whom have been with me for decades. They are Imelda Concepcion, Severino Marcelo, Ferdinand Ferriol, Reynaldo del Rosario, Arnel Cenidoza, Edgardo Lasala, Heherson Cortez, Alan Tarala and others who have worked with me through thick and thin, and willingly gave of their time and talents. Thank you. Tonight I am glad to be able to share this unique honor with you. And to the members of the UAP Makati Chapter headed by Ar. Klari-Angelika Limdico who initiated this Likha award nomination, thank you for recognizing my humble contribution to the architectural profession. To the members of the UAP National Board headed by Ar. Benjamin Panganiban, Jr., the College of Fellows led by Chancellor Richard Garcia, and the Jury of Fellows chaired by Ar. Ana Mangalino-Ling; for your love and support and long hours of toil, my heartfelt Thank You. And last but not the least, I would like to thank God for everything. I have been a Christian all my life and I have dedicated myself to serve Him and vowed to glorify Him in all my undertakings, including the profession I cherish so much. Ladies and gentlemen, allow me now to say something about myself. Since my early childhood days, I already had an inclination for the arts. Beautiful things fascinated me and I also loved to draw and design. I received good grades in art subjects in school and was always being asked by my friends in the church and school to design logos, posters, bookcovers and even stage decorations for them. I used to do all these things up to the wee hours of the morning to the point of losing much sleep, but I enjoyed doing it. As a child, I also collected stamps, coins and even cigarette pack wrappers. I was so fascinated by their beautiful design and I would look at my treasured collections over and over again, several times a day to the point of being reprimanded by my father for wasting so much time on them. But this is something that I continue to do up to now, not on stamp collection, but on my design work. I am not tired of looking at it over and over again in order to improve it. Yes, I am that passionate about my work. I belong to the generation of baby-boomers born after the Second World War, at a time when resources were scarce and we grew up accustomed to hand-me-down school uniforms and second-hand text books; eating leftover foods and making our own toys. These have developed in me a hardy spirit, endurance, thriftiness; and led me to a more down-to-earth and cost-conscious approach toward my architectural design in later years. My father pursued a course in mechanical engineering but his studies were cut short by the Japanese invasion. Later on he worked as the general manager of a cold storage plant in Tondo, serving the refrigeration needs of fruit and vegetable wholesalers from nearby Divisoria. My father was a very resourceful person. He designed and constructed the cold storage plant including the electrical, sanitary and air-conditioning systems all by himself, obtaining the know-how simply by reading technical books and magazines. As a hobby, he dabbled in carpentry and even set up his own workshop where he would spend hours making wall lamps, table lamps and other pieces of furniture. I think I must have inherited his creative genes. On the other hand, my mother was an elementary school teacher for 19 years. I remember every week she had to prepare exam papers and being the artist in the family, I was the one she regularly tapped to make the pictorial illustrations on the exam papers. I still remember that it was done on Gestetner stencil paper and mimeographed. My mother was one of the most beautiful ladies in her time. She had grace and style. When she passed-away six years ago in Toronto, Canada at the age of 91, I heard the eulogies of my nephews and nieces who shared about how they admired my mother whom they remembered as having a regal bearing, just like Queen Elizabeth of England. As a boy, for a period of time we stayed in the big cold storage compound. As such, we did not have next-door kids to play with. But our house inside the compound had a small garden with a lot of plants and I usually spent long hours playing alone there with my homemade toys and this developed my imagination and moulded me to become a more contemplative person in later years. The big compound also offered me and my siblings a wonderful playground for many adventures, from climbing delivery trucks to playing with the pushcarts or “kariton” parked there overnight. It was a place where we could roam and run; learn to glide on roller skates and ride the bicycle and all these had developed us with healthy bodies and active spirit. We also explored the cold storage building while it was under construction during expansion time and this actual experience had influenced me a lot in wanting to become a builder someday. During my school days at FEU-Boys High School, aside from art subjects, I excelled in algebra and geometry, too, especially in geometry. I was very attracted to the study of various shapes --- triangle, square, circle, etc. with their corresponding properties. I especially loved the problem-solving part of geometry where a lot of imagination and mental exercises are required. All these have led me to take up architecture in college later. But ladies & gentlemen, I believe I would not be here speaking to you tonight if it were not for my mentors who opened my eyes to the wonderful world of architecture. I came from a middle-income family and my parents were just plain folks who were not even acquainted with any prominent architect. My closest encounter with the architectural world was only through the few small building contractors that my parents knew. Things changed when one day during my 3rd year in college at UP, my professor Ar. Froilan Hong unexpectedly offered me a summer job as an apprentice in his office at Felipe M. Mendoza & Associates. On my first day at the architectural office, I had to start from the bottom. I had to make title blocks for construction drawings by using templates and mechanical pens. Then I had to pull out all the old tracing drawings from their canisters, roll them in the opposite direction and put them back again in the canisters. I also had to help in the white printing of drawings. As there were no copier machines then, so even letter-sized documents had to be either mimeographed or white-printed in order to produce multiple copies. You can just imagine how thick a complete specification book looked like at the time. And no, I did not have to shine the shoes of senior staff in the office as other apprentices who preceded me did. Or did they, really? I wonder…. My first bi-monthly salary was P91.00. But by re-arranging the original tracing drawings, reproducing and compiling the contract documents, I got an in-depth familiarity with various building plans and specification documents which put me in good stead later on. I was also guided by the Biblical teaching that “Whatever you do, work at it with all your heart, as working for the Lord, not for men.” (Colossians 3:23). Eventually, I advanced to drafting and designing and even got the chance to meet with clients. I was also able to interact with engineers and this would help me a lot in becoming a more experienced architect later on. Ar. Mendoza was very active in various professional organizations as he believed that a true professional is not someone who is only good in handling his projects but should also be someone who devotes part of himself to the betterment of the profession. So he participated in many professional organizations such as the UAP, Kanlungan Foundation, Architects Regional Council of Asia (ARCASIA) and even in multi-disciplinary organizations such as the Philippine Federation of Professional Associations, the Philippine Technological Council, the Philippine Council for Planning & Housing and the ASEAN Association for Planning & Housing in order to strengthen architecture and other allied professions. After passing the board exams in 1971 and with the blessings of Prof. Hong, I applied at the office of Leandro V. Locsin & Associates, a firm known for their creative designs. I was readily accepted probably due to my newly-acquired credentials from Ar. Mendoza’s office. At the new office, I was in the company of highly-creative people whose design prowess rubbed on me. This experience with Locsin’s office has greatly widened my design horizon. I also remember one time I consulted Ar. Leandro Locsin on a design and he advised me to always believe in myself and my ability, an advice which I kept to heart to this day. 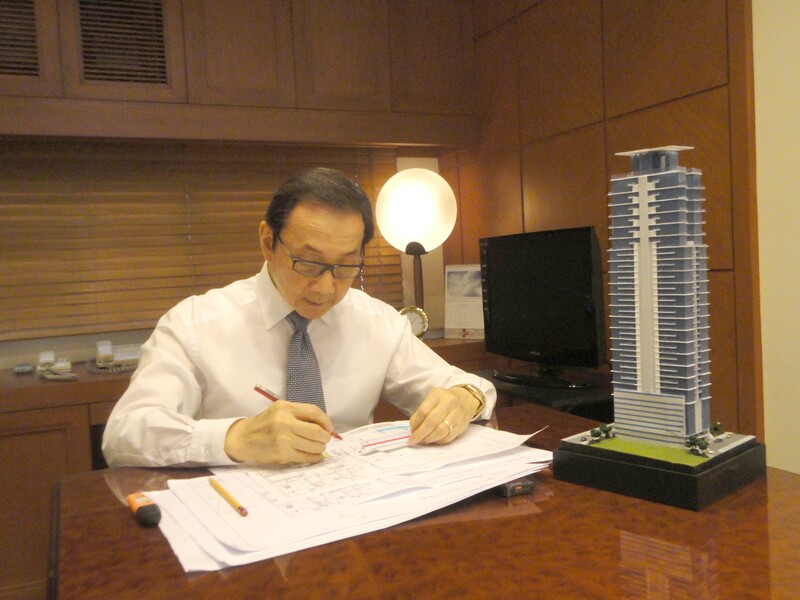 Later, I was engaged by Singaporean elder architect Ang Kheng Leng to be one of his three (3) executive architects and was even entrusted with a major project --- the 50-story International Plaza which was the tallest building in Singapore at the time. I was pleasantly surprised to be given my own room and a secretary, noting that back in the Philippines, I was only occupying a small drafting table as a new architect who had just passed the board exams. Ar. Ang Kheng Leng also gave me a free-hand in handling my assigned projects supported by a team of able draftsmen and supervisors. Occupying an executive position at a young age has further boosted my self-confidence and inspired me to aim even higher. My work experience in land-scarce Singapore has enriched me with invaluable professional skills and savvy, in addition to becoming more self-reliant, resourceful and prudent as a person. And the 50-story International Plaza project which I handled has given me an early start on a career in high-rise building design. When David SyCip, Jr. & I started our own architectural practice in Manila, we rented a small 30 sq. m. space at the RCBC head office building along Sen. Gil Puyat Ave. in Makati. It was actually a vacant Store Room. I remember it had a steel door, four thick walls and no windows. So we had to convert it into an office by changing the steel door to a wooden one, making a new window opening and adding more electrical power. After setting up the office, we had to make the rounds visiting prospective clients in order to get projects. Those times were tough as we had only a few projects at hand and were barely breaking even. I remember one day after office hours when the staff had already left and I was all alone in the office, I found out that I had only 50 centavos left in my pocket. Instead of being dismayed, I recall saying to myself that I would certainly remember this particular day when I become successful someday. Perhaps today is that “someday” I was looking forward to on that consequential day in 1976 when I was so hard up. It had been a long journey indeed. 1. Be grateful to your mentors, and also be a kind mentor yourself in helping other aspirants to the profession. 2. Dedicate part of yourself to the betterment of the architectural profession by actively participating in our professional organization – the UAP, and not just devoting full-time to your projects. 3. Be positive. Don’t let hard times crush you. Take it in stride. Learn from your mistakes and move on. Pray and trust God. After all these years of striving, I have come to the realization that everything is really in the hands of God. We can plan, work hard and do our best, but only He can make things happen. And to call on Him, we must first establish a right relationship with Him. We must confess our sins and ask God for forgiveness, and then accept Jesus Christ into our hearts as our personal Lord and Saviour, and God will take care of us as our heavenly Father. This is my personal experience. Following the footsteps of my mentors who have opened up opportunities for me to enter the architectural profession, I was also able to facilitate some top architecture graduates from the University of the Philippines to enter the profession by undergoing job training in Singapore, Hongkong and Shenzhen, China through the Philip H. Recto Design Excellence Award program, because I believe in the importance of acquiring a foreign work experience to complement one’s education and capability. Most of the Recto awardees have been sent to Architects 61, a prestigious architectural firm in Singapore whose principals have been my friends since the time I was working in Singapore --- at a time when we were all just starting our respective architecture careers. It is good that after all these years we are still in touch with each other. In life, we will meet many people. Let us learn to cultivate and treasure friendships. We have also sent awardees to be trained at Ronald Lu & Partners in Hong Kong, while others were sent to SRT (S&P) Architects in Shenzhen, China. Both firms’ principals are also my friends whom I met at international architects conferences abroad and have established long-standing friendships. I am also glad to say that 4 of the Recto awardees at Architects 61 in Singapore were recently promoted to the position of Associate while other awardees are all doing well and handling significant projects as they steadily rise in their office’s organizational hierarchy. On the other hand, let us remember to give our support to the architectural organization – the UAP, by actively participating in its projects and activities, generously contributing our time and talents in pursuing its vision, mission and objectives. Ever since I joined the UAP in 1979, I have been participating in its activities, either at the national or chapter level, doing my part for the advancement of our profession. At this time when the supremacy of the architect’s role in the building industry is being challenged by other professionals, let us band together to uphold our profession. It seems that architects nowadays are being relegated to mere designers or even just CAD operators in the project team. It is time for us to prepare ourselves adequately for the leadership position and put the Architect back in Focus as the Prime Professional which is the theme of this year’s national convention. Fellow architects, the road ahead may be rough, but know that there is no limit to what one can do once he puts his heart and mind into it. A lot can be achieved by a determined person with the help of our Almighty God. I would like to close with a poem by Walter D. Wintle entitled “The Man Who Thinks He Can”. It is almost a cinch - you won't. Ladies and gentlemen, have a pleasant evening.